Hoss’s Steakhouse has 35 locations across Pennsylvania, from Chambersburg to Erie to Williamsport. But the restaurant at 195 Aikens Center in Martinsburg holds the distinction of being the only Hoss’s outside of Pennsylvania. And while other locations in New York and Virginia have closed in recent years, the Martinsburg Hoss’s is thriving, according to general manager Dallas Grim. “I feel like we have a very loyal customer base,” said Grim, who has been with Hoss’s since 1996, just three years after it opened in Martinsburg. The company itself was founded in 1983. Grim began his career as a dishwasher, making minimum wage – which was just $4.25 an hour at the time. He stayed with the company even after going away to college, and he worked his way up the ladder until, in 2006, he was promoted to general manager. Since then, he said, the local labor market has gotten tighter as Martinsburg and the Eastern Panhandle have continued to grow. There are more restaurants in the area now, and so potential employees have more options from which to choose. Still, filling a vacancy has never been a struggle. Hoss’s currently has about 55 employees, both full- and part-time. Grim said his new hires often come through referrals from current employees, drawn by a set of perks that includes being closed for seven holidays every year, which, according to Grim, is practically unheard of in the restaurant industry. And once they arrive, many of those employees stick around for a while. One worker had been at Hoss’s for more than two decades before recently moving to Florida. A couple of them have been at the restaurant for more than 15 years, and several others have at least a decade of service under their belts. Many of Hoss’s customers come from Martinsburg, Spring Mills, Falling Waters and Shepherdstown, while some regulars come in from Maryland on a regular basis and a few found their way to Martinsburg after the Hoss’s location in Winchester closed a few years ago. The restaurant’s proximity to Interstate 81 has also been good for business. Grim sees people coming in from nearby hotels, and, he said, quite a few out-of-state travelers make a point of stopping at Hoss’s whenever they travel through Martinsburg. Grim said many of the children who used to come to Hoss’s when he first started working there are all grown up now and often bring their families into the restaurant. 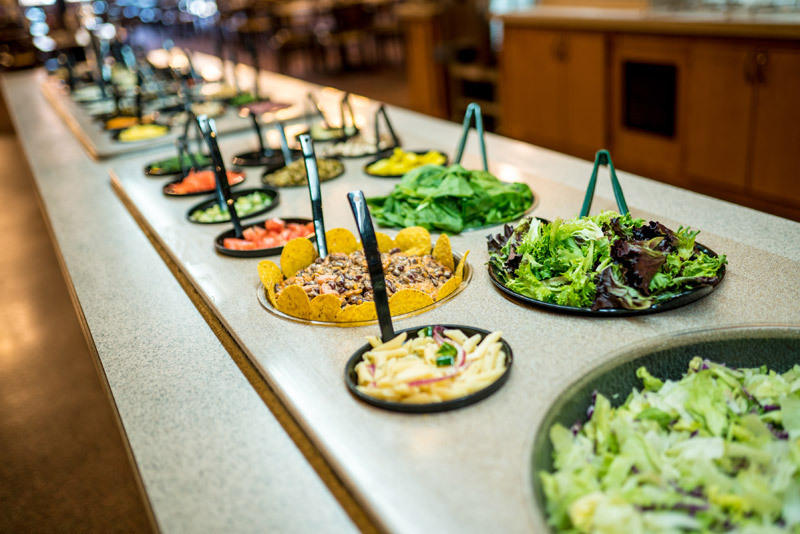 Hoss’s Restaurant is known for its all-you-can-eat salad bar, which also features soup, bread, side dishes and desserts. But its specialties, including steak and seafood dishes cooked to order, along with sandwich and other entrée options, are just as popular. According to its website, Hoss’s focuses on “considerate service, delicious food and a pleasant environment.” There are no hidden costs – extras like butter, gravy, sour cream, fried onions and an assortment of sauces and condiments are provided free of charge. 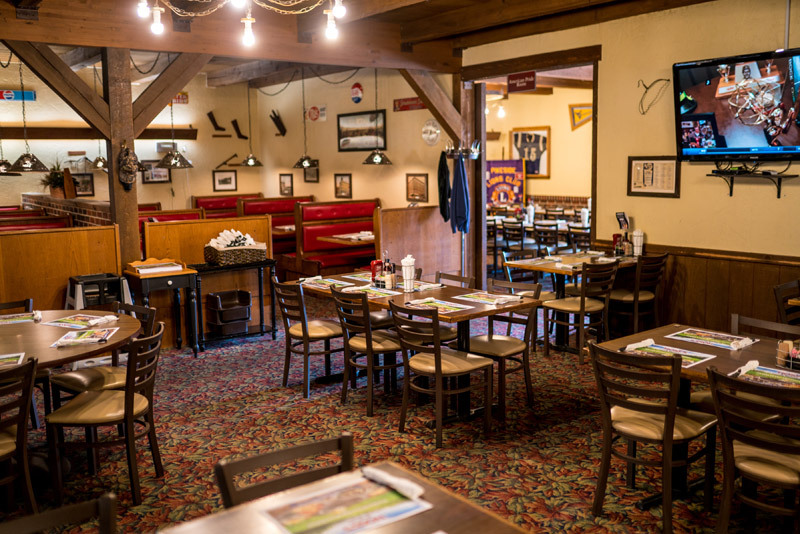 In addition to being a full-service restaurant, Hoss’s also has a banquet room with seating for 70 guests that is available for special events. The room has been put to good use through the years; some people have even gotten married at Hoss’s, Grim said. Grim and his staff try to be involved in the community as much as possible. The restaurant offers a 15 percent discount for members of the military as well as for employees of the Berkeley County school system, including teachers, bus drivers and other personnel. Hoss’s also provides a 50 percent discount to all first responders, including police, fire and EMS employees. And the restaurant is a popular destination during the holidays, hosting Halloween parties and pictures with Santa Claus and the Easter Bunny. The Hoss’s staff tries to be a positive influence on the community as much as possible, Grim said, by offering spirit nights and other fundraisers. The restaurant also donates to various groups and provides soup to local soup kitchens. The restaurant business has been evolving in recent years, and Hoss’s has tried to keep up with the changes. According to Grim, the chain was ahead of the curve several years ago when it began providing nutritional information on its menu and its website. Hoss’s has also tried to help its patrons who have food allergies or may be on special dairy-free or gluten-free diets. Customers can go on their phones and visit the restaurant’s website to check the menu and make important decisions about their meals before they order. Earlier this year, in an effort to trim costs, Hoss’s separated its entrees from the salad bar. Some customers, Grim explained, come in for an entrée and don’t necessarily want the salad bar added to the cost of their meal. Keeping prices down has been a challenge, Grim said, with the cost of food climbing dramatically in the last five to seven years. But Hoss’s has continued to offer value to its customers. For example, a 6-ounce sirloin steak with salad and a hot side costs just $9.99. That commitment to value seems to be paying dividends for Hoss’s in Martinsburg. The restaurant typically feeds about 250 people a day during the week; that number usually doubles on weekends. As a result, the Martinsburg location is ranked among the top 25 percent of Hoss’s restaurants for profitability, and sales have increased for three years in a row. “So we’re doing something right,” Grim said. Grim often meets people in the restaurant who have never eaten at a Hoss’s before. Providing those new customers with a satisfying dining experience, and the desire to return again and again, is a challenge he enjoys meeting. Hoss’s has a sister restaurant, Marzoni’s Brick Oven & Brewing, an Italian-themed eatery that currently has five locations. The closest one is in Mechanicsburg, Pa., but according to Grim, the company is looking to open a restaurant in Hagerstown, and Martinsburg could be a possibility at some point. Hoss’s does have catering available, and often provides food for events at the nearby Comfort Inn. The only caveat is that the restaurant’s catering clients need to pick the food up and bring it to their events. 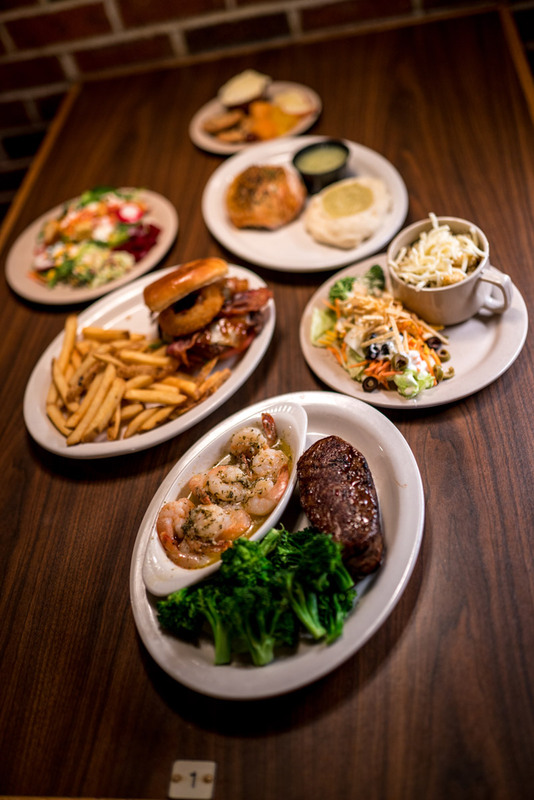 Though it is best known for its steaks and its salad bar, Hoss’s has several entrees that are also top sellers. Grim said the stuffed chicken is a popular choice among restaurant patrons. So, too, are Hoss’s burgers and sandwiches. Aside from steaks, the burgers might be the menu item that generates the most customer feedback. Hoss’s Steakhouse is open from 11 a.m. to 9 p.m. Sunday through Thursday, and from 11 a.m. until 10 p.m. Friday and Saturday. For more information or to see the menu, call 304-267-2224 or visit hosss.com.